Summer is a perfect time to be in Summit County - and Breckenridge, Colorado. There are many Summit County activities to choose from, depending on which town you're in, so it's important to review all of your options when planning your trip. What to do in Breckenridge in the Summer? Breckenridge offers everything from sophisticated art festivals and shopping on Main Street to classical and contemporary music concerts at the Riverwalk Center. The hot springs near Breckenridge Summit County weren't the only pampering that my mother found. 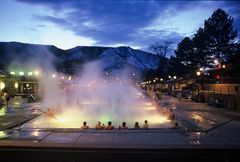 In Vail and later in Breckenridge and Silverthorne she discovered day spas and salons enough to make a socialite weep. In the opinion of my well-bred mom, there is no better way to spend the day than soaking in gourmet mud, steaming in mineral springs, then having her face and hair fixed by a professional. 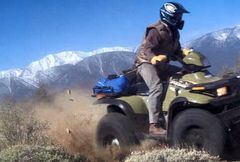 We took some route that were steeper than the previous time, and the thrill of traversing a deep slope left us pausing for breath over looking a stretch of Breckenridge Vail Valley from the back of our ATVs. It was a great moment. Looking for gold mine tours in Breckenridge Colorado? 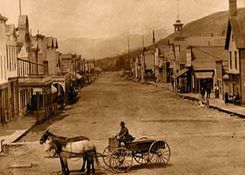 The town was founded as a gold mining community and gold mine tours are a popular summer attraction. 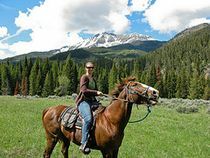 Explore the Ten Mile Range like the pioneers did on horseback rides at Breckenridge Stables. Let your imagination awaken as you listen to the clumpety-clump-clump of the horses hooves on the dirt, and pretend you’re encountering the West for the first time. All trail rides last 1 ½ hours and guide visitors between Peaks 9 and 10, through rivers and along beaver ponds. 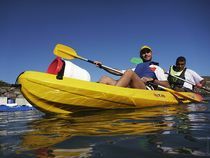 The kayak park in Breckenridge is Colorado’s largest. Feel the cool water on your skin as you make your way down splash rocks, eddie pools, play waves and s-curves. The park is located behind the recreation center, on the east side of Kingdom Park, between the Blue River pathway and Highway 9. For biking and hiking, hop on the chairlift that sweeps you to the summit at more than 12,500 feet, and take in the spectacular views of the countryside. Or in-line skate, bike or walk the paved path that stretches from Breckenridge to Frisco, along a babbling brook and through pine forests and beyond. Breckenridge Summit County Colorado feels like the top of the world, and when you are 4WD through Vail Valley, you feel like you have conquered this beautiful territory. The town of Breckenridge holds the honor of owning the only Jack Nicklaus designed golf course. The 27-hole course lies in a gorgeous mountain valley, and the course winds through dense wooded areas and open native grassland. Sightings of beaver, deer, elk, red fox and red tail hawks are common. The clubhouse sits at an elevation of 9,324 feet. Though breathing may be more difficult at this elevation, golf balls fly farther and straighter than at lower elevations because there is less air resistance. Imagine your satisfaction as your drive makes the ball soar farther than you thought. The tees on the Elk/Beaver rotation have the second most difficult course rating in the state. Each set of four tees plays to a par of 72. For a small community, Breckenridge delivers some amazing live theater productions. Broadway leads have performed in the local theaters, because Summit County is where they spend down time. The Breckenridge Arts District is becoming more and more popular as it expands its offerings. Weekly classes for adults and youth include painting, pit-firing ceramic ware, beading, mosaics, landscape and wildlife photography. The Fun Park at Breckenridge Ski Resort on Peak 8 offers summer activities for visitors of all ages. Scale up the vertical climbing wall, complete with colorful hand and footholds. Zoom down the winding alpine slide, bounce and somersault on the sky-fly power trampoline, or make your way through the largest human maze in Colorado. 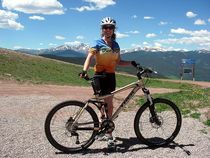 What to do in Breckenridge in summer. Transport yourself back to the 1880s at the Lomax Mine, with its authentic carriage house, assay office and miner's cabin. Original artifacts fill the assay office, where miners brought in samples to determine the value of their gold. After learning about mining, visitors can try their luck at panning for gold. I did learn a lot about what it takes to fish in Summit County and how many different ways there are to go about it. It is a lot harder than it looks to keep that line moving over the water and nearly impossible to move in water. You get a strength work out just walking back to shore! On that eye opening experience we were fly Breckenridge fishing for cutthroat trout. There are 4 other varieties of trout available in the rivers and lakes of Summit County. Independence Day in the Breckenridge. 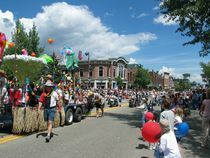 Come and enjoy 4th of July in Breckenridge. Celebrate Independence Day with lively: free concerts at the Riverwalk Center, Mountain bike races, kids activities on main street, art festival, the amazing 4th of July in Breckenridge fireworks display, and our fourth of July parade down historic main street. Imagine soaring above the Colorado Rockies, getting a view once found only among the birds. Summit County Breckenridge Ballooning offers the flight of a lifetime.